In which masked murderer Michael Myers escapes a mental institution and starts killing people on Halloween night in his hometown of Haddonfield, Illinois. The pinnacle of the slasher subgenre, and a master class in using minimalist music, editing and visual composition to create a sense of implacable dread. New Mythology: We meet Laurie Strode (Jamie Lee Curtis), who narrowly survives Michael’s attacks, and Michael’s psychiatrist Dr. Loomis (Donald Pleasence); both feature prominently in the sequels. Also established: Michael’s apparent invincibility. Later that same night, Michael, still kicking, follows Laurie to the hospital and terrorizes her and the graveyard-shift staff. The closest the franchise got to aping Friday the 13th, with faces submerged in boiling water and syringes plunged into eyeballs. New Mythology: Michael’s real reason for targeting Laurie: They’re long-lost siblings. Gasp! This twist guides the rest of the franchise, for better or worse. How does Michael “get it”? Shot in the other eye, then engulfed in flames. RIP? The odd duck of the franchise: There’s no Haddonfield, no Dr. Loomis, no Michael Myers. This is a standalone entity, with an evil novelty manufacturer called Silver Shamrock selling cheap Halloween masks secretly designed to kill kids. Equal parts goofy and unnerving, it’s a singular curiosity that has developed a well-earned cult following. New Mythology: None, but you can see some of those creepy Silver Shamrock masks in the 2018 Halloween. How does Michael “get it”? Well, he doesn’t. He was getting some much-needed rest this go-around. We now return to our regularly scheduled programming. Michael emerges from a decade-long coma, escapes custody, and again wreaks havoc on Haddonfield with a personal score to settle. New Mythology: Who’s he after this time? Well, Laurie Strode has died in between movies, but she left behind a young daughter named Jamie (get it?). The girl appears to have inherited her uncle’s bloodthirsty ways, because after successfully evading him, she stabs her foster mother while dressed in a clown costume in the movie’s final moments. He escapes somehow, and is nursed to health by an old hermit, Frankenstein-style. A year later, he emerges to terrorize Jamie again, with Loomis on his trail. New Mythology: OK, so Jamie wasn’t actually a killer — her foster mom was only injured — and now the little girl is mute from trauma. She’s also telepathically linked to her uncle now, which allows her to narrowly escape him again. The film also introduces a shadowy deus ex machina known as the Man in Black. More on him later. How does Michael “get it”? He’s tranquilized, then old Loomis whacks him with a board. (Isn’t he a superhuman?) He’s jailed, but the Man in Black busts him out, and the audience heaves a collective sigh. Tommy Doyle (a clearly embarrassed Paul Rudd, in his film debut), one of the kids Laurie babysat in the first Halloween, tries to warn Haddonfield that Michael is back again. Will anyone listen? Loomis, now missing the facial scars he sported in the last two movies, is still kicking about, too (Pleasence died before this movie hit theaters), and some “relatives” of the Strodes have conveniently moved into the abandoned Myers house, in what has to be the worst real estate deal since Amityville. New Mythology: Buckle up for this one. Jamie has just given birth to the next descendent in the Myers bloodline. She escapes from a cult that wants to sacrifice the baby, only to be killed by Michael; Tommy later finds Jamie’s baby in a bus station bathroom. We also learn of a druid curse, which is the reason Michael can’t be killed, and that the Man in Black, who is apparently leading the baby-sacrificing cult, is also the head doctor at the sanitarium from which Michael originally escaped, and… well, because this movie flopped, these are all narrative dead ends. How does Michael “get it”? Do you really care at this point? Psych — Laurie Strode lives! She’s changed her name, has a teenage son (Josh Hartnett) and is now principal of a California boarding school. But Michael tracks her down anyway, driving cross-country (now that’s the movie I wanna see) to confront his sister 20 years after they first crossed paths. New Mythology: Installments four, five and six have now been erased. In this timeline, Jamie never existed, Laurie (obviously) never died, and Michael has apparently been dormant since that fateful night back in ’78. Keeping track of all this? How does Michael “get it”? Laurie pins him to a fence with a truck, then decapitates him, his reign of terror finally at an end. Psych — Michael Myers lives! Here we reach the bottom of the Halloween barrel, and what a deep barrel that is. Busta Rhymes and, uh, Tyra Banks star as opportunistic TV producers who strap cameras to some annoying college kids and make them spend a night in the Myers house for a rapt internet audience. Guess what happens next. 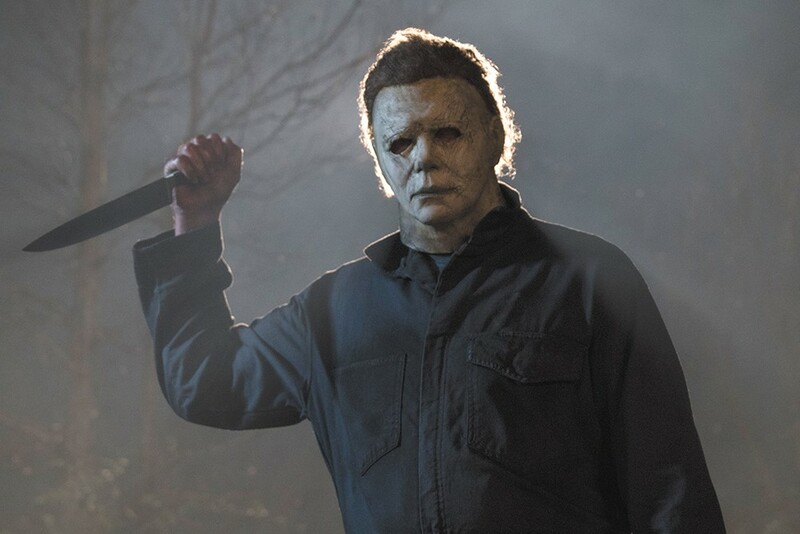 New Mythology: Turns out Laurie didn’t really behead Michael last time: It was some poor schmuck in Michael’s mask, and that mistake has driven Laurie mad. Curtis returns only to be knocked off by her evil brother in a lousy prologue, and there’s no mention of any surviving characters from H20. How does Michael “get it”? Busta Rhymes overpowers him with kung-fu, then electrifies him right in the groin. Cause of death: embarrassment. OK, everything you’ve just read? Just pretend most of it never happened. This new Halloween wipes the slate clean and ignores the convoluted mythology from Halloween II on. Michael and Laurie aren’t siblings, there was never any cult or poisoned bloodlines and Paul Rudd became a terrific comic actor. This turns out to be the right decision. Director David Gordon Green has wisely channeled Carpenter’s original (perhaps a bit too closely, one could argue), crafting a meat-and-potatoes thriller about an unstoppable killing machine and the trauma he leaves in his wake. It has some narrative dead ends, but Jamie Lee Curtis, returning as an emotionally weathered Laurie Strode, finally gets a plotline worthy of her talent. It’s nowhere near as gripping as the original, but it’s as good a Halloween sequel as you could hope for. Here’s hoping they keep it simple from here on out. The original print version of this article was headlined "Michael Lives"